Follow in the footsteps of legends on a 19-day journey to an iconic symbol of challenge and adventure. At 29,035 feet, Everest soars high against a backdrop of vast blue sky. Nepal Guide Info team staff has dialed in every detail of the journey to EBC providing insider perspectives and supportive tips throughout the journey. The classic Mt.Everest Base Camp journey begins and ends in Kathmandu. Nestled between mountains and plains, the city is alive with energy. Explore villages dotted with fluttering prayer flags and become familiar with colorful Buddhist and Hindu traditions. Spend several days hiking to surrounding villages, discovering remote monastic caves and acclimatizing the body to the elevation. See the fabled Khumbu Ice Fall and its towering sera’s from a distance. From there, we hike 18,100 feet to the summit of Kala Patter for an unobstructed view of Everest’s windblown summit. We return home to tell tales of our legendary adventure. Day01: Arrival in Kathmandu overnight Kathmandu. Although we generally adhere to the schedule above, the itinerary is subject to change for numerous reasons beyond our control, including weather and terrain conditions, suitable campsite availability, and the group’s general fitness level during a hike. It is important to understand that our trek is logistically complex and it is not unusual that adjustments be made. 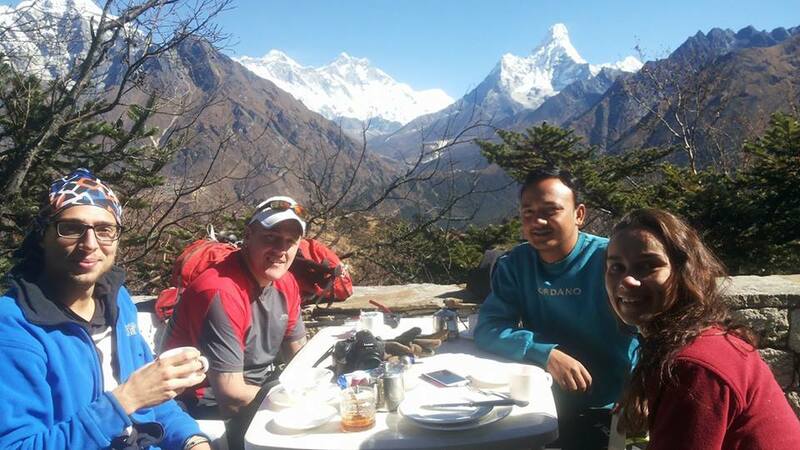 Nepal guide info team guide will orient you each evening to the following day’s plan, and their good judgment is the key to the long history of successful treks that Nepal guide info team has led in the Everest region. Please remember that our ability to make adjustments as needed helps to ensure that your trek is successful. Thank you! There are two ideal “weather windows” for Nepal. From the latter half of March until the first part of May temperatures are relatively warm, 10° to 15° warmer than in the fall. Mornings are bright and clear with the air slowly becoming hazier as the day progresses day by day. The rhododendron forests in springtime are spectacular, with color displays that are “Himalayan” in beauty. June is warm and green with very few other trekkers – the sense of solitude is much greater than other seasons. However, it is more likely to include rain showers, hazy skies, wet and muddy trail conditions and possible flight delays. Afternoon rain showers do occur in June and mountain views can be sporadic or interspersed with clouds. The fall season, the latter half of October through December, is an ideal time for the best mountain views. The days are typically sunny and clear with moderate temperatures and the evenings are usually quite cold…frosty, to be exact. Trekking to the very high Mt. Everest Base Camp region (at more than 17,000 feet) can include 0° temperatures at night and a 50% chance of some snow anytime above the 13,000 foot level. During the day, above 15,000 feet, do not anticipate temperatures above 35°. Again, since your body is taking in less than half its normal supply of oxygen, 32° will feel colder than we are accustomed to at home. This trip is subject to the booking information set forth in the current Nepal Guide Info Team Reservation Information. Please read this information carefully and call us or Email us if you have any questions about EBC trek.